In 1987, after a competition full of fireworks, the American architect Richard Meier beat the favourite (OMA) to collar the commission to build a new City Hall. Three years later construction began on a mixed-use building. Combining shops, rentable office space, a public library and the City Hall itself, it is the hub of the redevelopment of this part of the city centre. 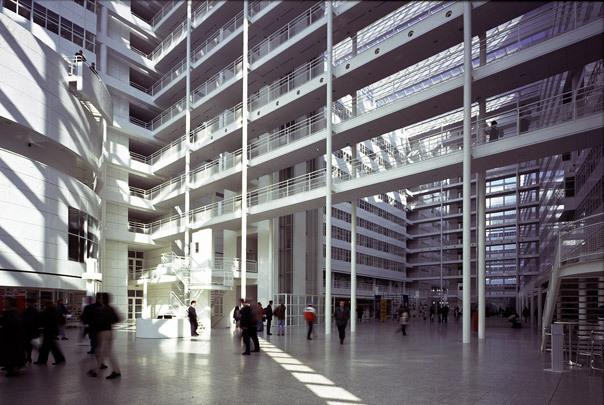 Two office wings lie along the long sides of the available plot, separated by a vast public atrium sporting a glass roof. A key attention-grabber is the cylindrical library at the building’s head end on Spui.